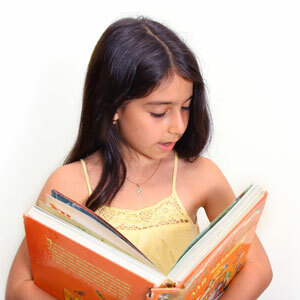 How to develop the reading habit in children? For a healthy learning attitude, your child should be interested in reading from the early age. In this situation, parents play a very important role. Only parents can teach their child how to read in the creative ways from an early age. Select the best time to read with your child. It may be before or after the dinner. Give a comfortable and calm environment to your child for reading. Whole family should read together. This would have positive effect on your child. Ask your child to select the book of his own interest for reading. Use picture books for better understanding with your child and ask him to turn the pages. Explain the pictures and characters of the books in an interesting style. Ask your child to recognize the shape, colors and animals. Ask your child for reading aloud. Teach your child how he can interpret the story using his own creativity and imagination. In the restaurant, you should read the menu loudly before your child. Also read the grocery items loudly in the market. Also make pasta or cereal letters to spell out during meals. Why it is necessary to read aloud? If children continuously see their parents involved in reading, they also get influenced by them. They actively participate in reading activity with their parents. Parents can also use audio cassettes for healthy reading habits. In this way, child can share happy reading moment with their parents. Most of the children react best in their playtime. During playing hours, they consider the reading as funny moments. Involve your child in daily conversations for developing good reading habits. This may be spellings or poems teaching during their playtime. Encourage your child for reading encyclopedia. Encyclopedia for very age group is available in the market. Daily activities are also the best style for teaching your child. Teach them how to recognize the commercial signs during walking or driving. Take him to the nearby malls and encourage him for making small sentences. Discuss with your child about different shapes and colors. Children love to learn sound of knowledge instead of writing letters. They understand the concepts quickly of the words they hear from their parents. Reading out loud before your child is an excellent style of making them more confident in schools. Everyday your child learns some new objects and spellings from you. The first five years of your child are the crucial development period of his life. This is the best time for your child to learn basic social and practical skills. In their preschool age, they have learned a lot from their parents and other family members. Many schools consider that preschoolers should already be familiar with a lot of concepts before taking admission in school. Most of the good readers had many positive experiences in their early age. Reading habits in the early age prepares a child for the bright future. You can issue a number of interesting books from public library. Also show your excitement for reading books with your preschoolers. Make your reading and communication style more effective before your child. Read slowly so that your child can understand you properly. Make your communication more impressive and expressive. Non verbal communication is an excellent style to deal with your child. You should ask relevant questions so that your child can express his thoughts properly. After parents, the next important partner in the life of your child is teacher. Only parents and teachers can teach the preschoolers about true meaning of life. They try to give the best possible education to their preschoolers. Parents should give proper care and love to their child that can help him to succeed. A lot of extra efforts are required for building strong relationship with your child. A number of schools are also working hard for creating family friendly environment. They regularly interact with the parents for describing the progress report of the preschoolers. Summer is the best time to teach your child about reading skills. Here are some important summer reading tips that you should consider for a bright future of your child. Read regularly with your child. Make it a fun for your child by reading outdoors. Keep a lot of reading stuff like newspapers, magazines and other story books around the house. When kids see their parents reading then they understand that reading is also an important part of life. Give a book to your child for reading. You should also read the same book and discuss it with your child. In this way, you can track the understanding level of your child. You can also know their creativity and opinions. Make regular visits to the public library with your child. If your child doesn’t have library card then sign up in the summer days. Ask your child for reading newspapers and magazines. After that ask him what he has learnt from his reading. Consistent reading is more valuable for child. Also play meaningful games with your child. These games are interesting style to teach your child. Decide regular timetable for your child so that he can enjoy the learning. Reading is an interesting style for breaking the boredom. Don’t make your child bookworm and teach him the practical skills. Try to make him more creative and imaginative. Reading not only increases the knowledge of a child but also makes him expressive for the outside world. Most of children take the reading as a burden only. Only parents can teach them how to read the books in an interesting manner. Children also learn how to deal with the social problems and negative consequences. Attend different seminars with your children. In this way, parents play an important role for developing reading habits in their children.